Selecting the right laptop for your purpose is a cumbersome process which requires an intensive research. However, even after investing so much time and energy towards it, in the end, we generally get confused as none of the laptops meets all our requirements. Sometimes, when we do get the configuration of our choice we find it over-budget. Selecting the right laptop for your purpose is a cumbersome process which requires an intensive research. However, even after investing so much time and energy towards it, in the end, we generally get confused as none of the laptops meets all our requirements. Sometimes, when we do get the configuration of our choice we find it over-budget. .
HP & Dell laptops were out of my list as their PCs with good specifications come with a high price tag. In the last few years Asus has proven itself in this field with decent budget-friendly laptops, so Asus was my obvious choice. Asus's 15.6 inches i5 7th generation notebook R558Q (Rs 45000/-) with 4 GB RAM, FHD screen and 2GB Nvidia 940 MX graphic card did appeal to me. But, here I was unhappy with the DOS OS and 4GB RAM. Pirated Windows hamper the performance of a PC, impede its full functionality and make computer susceptible to Internet attacks. Upgrading to Windows 10 and 8GB RAM put an extra burden of 13k, which defeated the very purpose of buying this budget laptop. 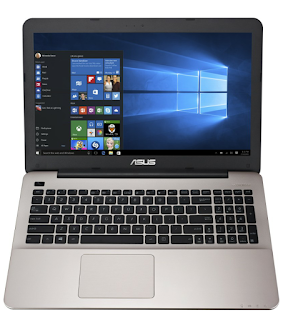 Then Asus's A series 555LF notebook PC caught my attention due to its decent specifications at a street price of Rs 37,300/-. 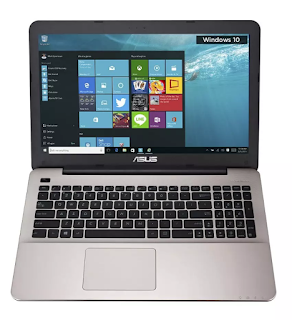 It is an i3 5th generation notebook laptop with 8GB RAM and 2GB Nvidia GeForce 930M graphic card and in this laptop Asus has left ample scope for upgrading. You can upgrade it later according to your budget and needs. Asus A 555LF, made of premium plastic is quite stylish and appeals in the very first look. The outer glossy brown finish with mosaic pattern, though a major fingerprint magnet, looks stunningly beautiful as the champagne tone interior leaks out from the edges and compliments the exteriors with a thin gold bezel, when the lid is closed. When you open the lid you are greeted by an ergonomic full-sized chicklet keyboard with full-sized numeric keypad, accentuated in looks by a brushed finish champagne gold keyboard deck, for a premium metallic look and feel. The power button is located on the left side, above the keys, and there is a 'Sonic Master' inscription on the right. The chicklet keyboard, with soft keys, ensures very comfortable noiseless typing. The palm rest is liberally proportioned and the touchpad is quite large with smart features and a smooth finish that offers minimal friction. The Smart Gesture Technology allows you to pinch-zoom in and out, or scroll through images and webpages with ease. The palm rejection feature differentiates between actual fingertips and palm contact to counter unintentional cursor movement. Though, the entire touchpad is clickable, left and right click works only when you press the corners at the bottom. The touchpad supports additional gestures for Windows 10, a three-finger tap brings alive Cortana, your assistant, alike Google Assistant on mobiles. Notification LEDs for power, battery status, hard disk activity and airplane mode are on the front. On the left side, we have an Ethernet port, VGA, HDMI, two USB 3.0 ports and a Kensington lock slot. USB 3.0 delivers ten times the speed of USB 2.0, so you can transfer photos, music, and even large video files in a fraction of the time. On the right side, there is a DVD writer, a USB 2.0 port, a headphone/microphone combo socket and a 3-in-1 SD/SDHC/SDXC card reader slot. The exhaust vent is concealed inside the hinge in a lateral position so that it doesn't heats up your lap while you are working on it. The rubber stands underneath give a strong base to the notebook, preventing any accidental skid when placed on table.USB Charger Plus, allows quicker charging of mobiles when the laptop is on. 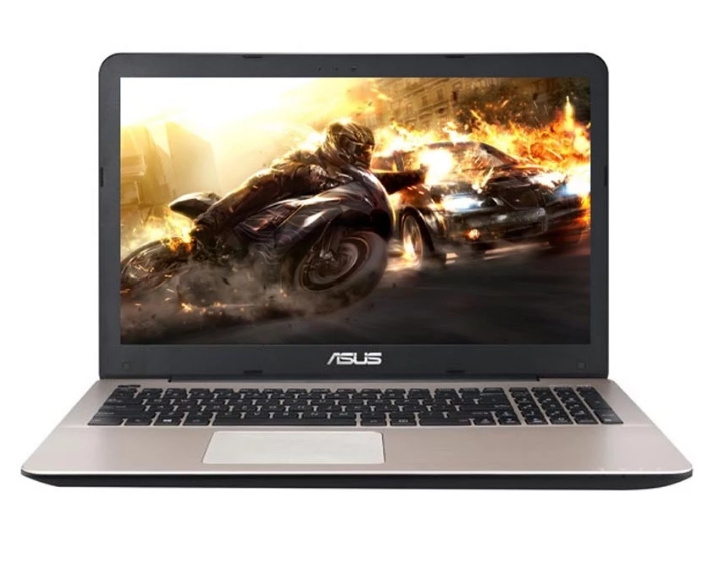 ASUS A555LF features a 5th-generation Intel® Core™ i5-5200U (dual core) processor CPU (2.1GHz) with speed upto 2.7GHz. Turbo Boost technology is missing, but, Hyper-Threading tries to make up for it. It has a dedicated 2GB, 930M Nvidia GeForce graphic card with Intel's mid range, Maxwell architecture. It comes with 4GB or 8GB RAM, which can be upgraded up to 12GB. This laptop has 8GB DDR3 RAM in a dual channel configuration which makes it quite fast during multitasking. One 4GB is soldered directly onto the motherboard while the other slot can be used to upgrade the RAM upto 12 GB. The removable DIMM, made by Samsung, supports a speed of up to 1600MHz, whereas the soldered chips, manufactured by Micron, go upto 1866MHz. It has 1TB HDD (5400rpm) which can be upgraded to a solid-state disk (SSD). In this laptop, Asus has left multiple scope for future upgrading. The processor and graphic card work in amalgamation to arm this notebook with a smooth and responsive computing performance. The 15.6" HD LED is backlit and has a slim anti-glare display. It has a resolution of 1366×768 pixel with 141 ppi pixel density. Despite some reviewers criticizing the resolution, I found the picture quality of this laptop pretty decent with good viewing angles too. 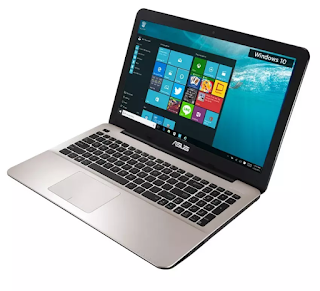 ASUS has employed Splendid Technology in its A series laptops which works towards enhancing the picture quality. It features four visuals modes which can be accessed with a single click. 2. Eye Care Mode reduces blue light levels and is ideal when you’re reading for long hours. 4. while Manual Mode is for advanced color adjustments. The company claims to have provided ASUS Eye Care technology in this laptop, which reduces blue light emission levels by 33% to make reading comfortable, and to protect from potential eye fatigue and other ailments. 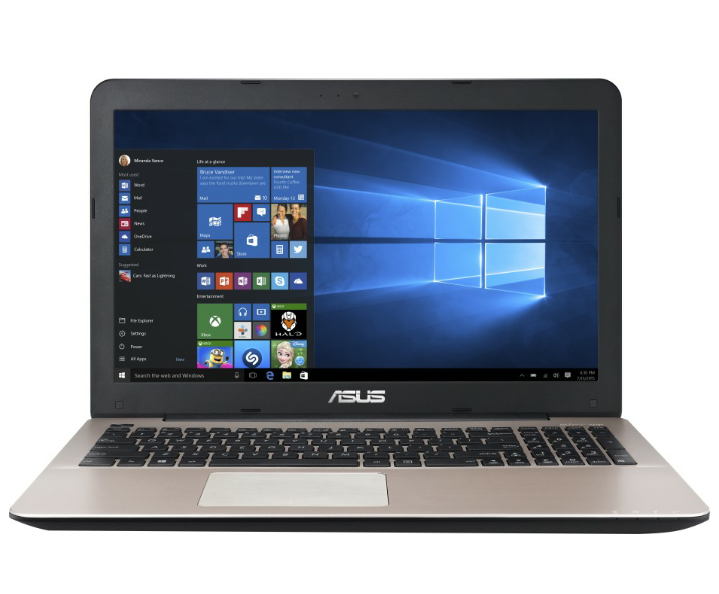 Audio quality is the forte of Asus as it has developed SonicMaster, a software-hardware combo that translates to powerful audio output with deeper bass. It comes out as a treat for music lovers and gamers. There is an AudioWizard, which helps you to fine tune your audio through five pre-set modes. Music mode brings alive your favourite songs, while Movie mode gives you cinema-quality audio. Voice recording feature on this lappy is very good as it filters noise and improves clarity. Gaming mode fully immerses you in the game, while Speech mode ensures clearer dialogue. Or if you prefer, you can take full control of the settings manually. It has a Lithium Polymer non-removable battery, which is equipped with Short Circuit Protection feature. The battery automatically shuts off when the control board detects a short circuit. With Cell TCO Protection, Asus has provided a guard against overheating too. It automatically stops charging when there’s an abnormally high temperature. It also has a Charge Protection feature that cuts off electric current when the battery is fully-charged or discharged. It gives 4-5 hours of battery backup in normal use and around 3 hours with heavy usage. 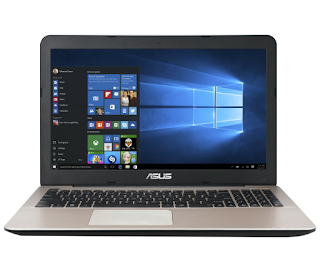 Asus A555LF comes with Windows 10 Home 64-bit edition and a bunch of other applications. Genuine windows give you the benefit of regular updates from Microsoft for your drivers and softwares, which maximizes the performance of your PC. WinFlash, lets you update the BIOS when needed. Asus A555LF also features a pre-installed 'GiftBox' a mini application store with special offers on paid apps. Asus HiPost is like Evernote but it uses OneDrive to sync files between different devices. With this notebook, you get McAfee LiveSafe Internet Security for 30 days. Each ASUS A series laptop comes with 16GB of ASUS WebStorage space free for one year. It gives you access to all your files as long as you are connected to the Internet. On high settings, games like GT Racing 2 and Asphalt 8 Airborne ran very smoothly, while Crysis 3, Tomb Raider (2013) and Battlefield 4 were also manageable and ran well without sacrificing much on video quality. Overall, I was quite happy with its pretty decent gaming performance. The web cam in Asus A 555LF is a major disappointment for people who chat frequently as it is only VGA. Asus should have provided an HD cam with this model. However, this glitch can be dealt with, by using an external web cam. 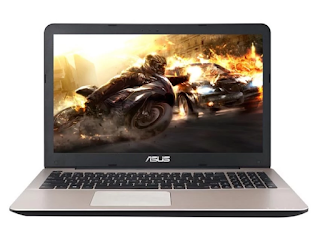 The general performance of Asus A 555LF is quite good. At Rs 37300/- this laptop with 8 GB RAM is a steal. Applications run well on this PC and I didn't face any issue with multi-tasking either. Browsing is fast. Video editing softwares work like a charm. 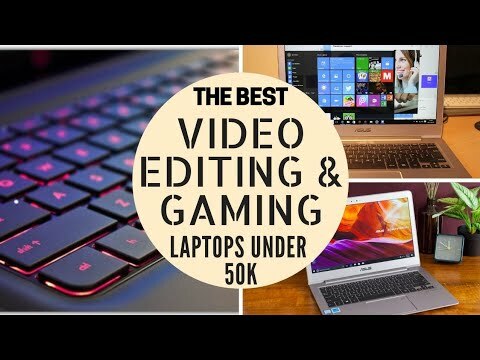 Genuine Windows, very good sound quality, decent gaming performance, pleasing aesthetics and smooth computing, work in unison to make this laptop one of the best budget laptops under 40k for video editing, gaming, browsing and business work. In fact, it would not be an exaggeration to say that working on this laptop is fun. Asus's 2 years' global warranty on this PC comes as an icing on the cake. I would advise you to buy it from the market as there you get some freebies along with it, like a laptop bag, mouse, cleaning solution, keypad guard and a pen drive. Some retailers even give you an Antivirus with a year subscription. It all depends on your bargaining skills. Sony will be following the same trend by offering a code at $10 for second-hand gamers and this initiative will begin with the release of Resistance 3.